Sometimes, life is so absurd that all anyone can do is laugh, even through tears. Laughter gets Robyn Michele Levy through her days and nights-and her tears. 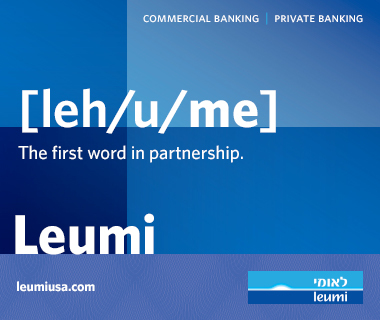 Levy, 48, was diagnosed with Parkinson's disease about seven years ago. Six months earlier, doctors determined that her father had the same illness. Eight months later, Levy found two lumps in her breast-cancer-that resulted in mastectomy and a prophylactic oophorectomy. This was beyond a mid-life crisis, but Levy—a Jewish Canadian visual artist, radio broadcaster, and writer, took it on, sometimes with grace, sometimes with anger and frustration, often with her caliginous sense of humor. "You have to kind of laugh at it," Levy said. "What else could possibly happen to me in the course of this time?" While recovering from her mastectomy, Levy experienced an outpouring of love and support from friends and family. She wrote darkly amusing email updates about her progress that found their way into a publisher's inbox-and a book was born. 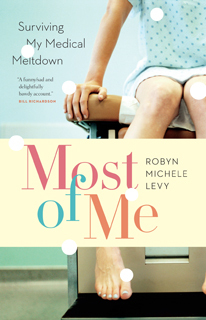 Levy tells her story in her newly-published memoir, Most of Me: Surviving My Medical Meltdown, in which she chronicles the characters that have become an integral part of her life, from the uncontrollable Cry Lady, perky Dolores the Prosthesis, and ever-dependable Big Pharma, to her caring husband, a daughter wise beyond her years, and one very loyal canine companion. An assortment of friends and an ongoing parade of medical personnel provide support, helping Levy take life day-by-day, though she readily admits that some days, she doesn't stride well at all-courtesy of Parkinson's. "I think that my humor is definitely a self-defense mechanism, but it's also a way to connect with people and a way for me to absorb some of the shock," Levy said. She credits her parents for her dark wit. She grew up in Toronto in a culturally Jewish home under the tutelage of her father's one-liners and her late mother's high-voltage personality. Despite her positive outlook in the worst of circumstances, Levy forced herself to be truthful straightforward throughout the book. "The first draft that I sent into my editor—she said it was funny, but she just didn't connect with me on an emotional level as a reader," Levy said. She reworked some of the chapters, including the opening: "I wasn't always like this: so moody, so anxious, so volatile," she wrote. She blamed her symptoms as premenopausal—but as they worsened and depression set in, she was hurting her relationships. The hardest part was consulting with her husband and daughter about her memories of that stressful time. "They were very candid. It was difficult to hear just how awful I was," she said. The process helped her family heal. Levy appreciates people's response to her story. "People often say they can relate to it, even if they weren't sick. In some ways, there's some universality to it," she said. Most of Me has been shortlisted for the 2012 Stephen Leacock Memorial Medal for Humor and is on the Jewish Book Council's Summer Reading List. Her radio documentary, Cruel Coincidence—about how both she and her father have Parkinson's disease—is a finalist at the New York Festival's International Radio Awards. For information on Robyn Levy's art, blog and multi-media presentations, visit www.robynlevy.ca.